I think you know by now that I’m still in Florida with my mom and my sister. My husband headed back to Poland on Wed. afternoon, but I’m staying until November 12. I had this brilliant idea of making some “10 squares packs” (similar to a Layer Cake by Moda) but made from many different miscellaneous fabrics that my sis has in the store. So, over the last couple of weeks as I’ve had time, I decided to work on them, cutting and choosing and cutting and choosing. This is my first one - and we are calling it “Children’s I Spy” pack. For all 42 squares, we are asking $26. Each square is different. But that’s not all, we are including in the package of squares the pattern that I thought would work well with it. From the beginning, when I envisioned it, I thought of a simple snowball block quilt. I chose the fabrics for this first pack of novelties with younger children in mind - up to about age 8 or so. But since the pack has 42 squares in it, you can choose from among them for your favorites in order to make your quilt! After I did the cutting, I collated them and then made them neat. After that, I tied them with fabric strings, putting on a label saying what pack it is. I hope to be doing various packs and they will be at least a little different from each other. Many of the fabrics have piqued my interest! You can get this package of squares here. We have a limited number of them, so if you want one at all, don’t hesitate too long! We are tucking a pattern inside each pack that you purchase. The pattern is written up in two sizes - a lap size and a twin size. If you want to order the novelty pack, AND the other fabric, simply choose 2.5 yards of a solid or blender like gray, red, blue, back, turquoise, etc. for each of the small ones you make. You can make one with reds and one with pinks! The packs have 42 squares and each of these small ones only uses 20 of them. 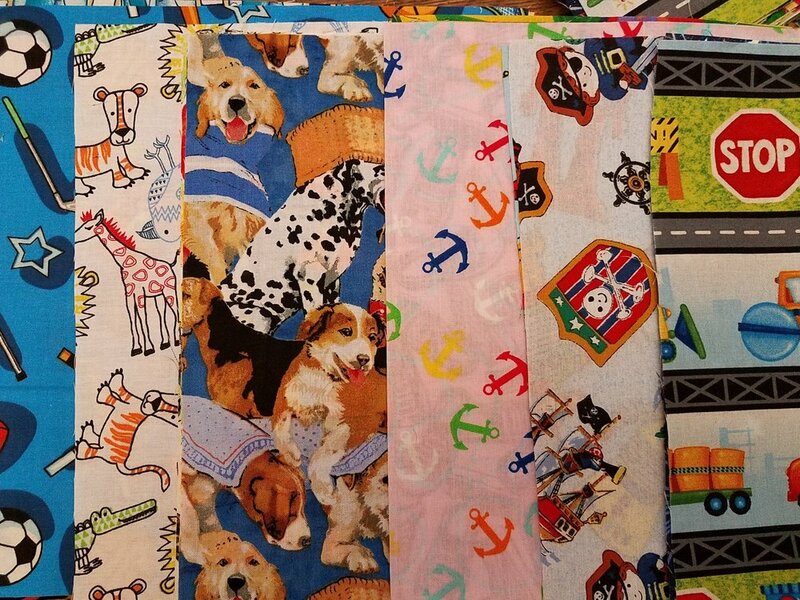 In addition to your package of 10” squares/novelties, you will need another fabric - maybe your child’s favorite color - or something completely different, like gray or tan. I chose gray only because the other fabrics show up easily with them as contrast. I call this design “I Spy Simplicity” - and it is really easy! 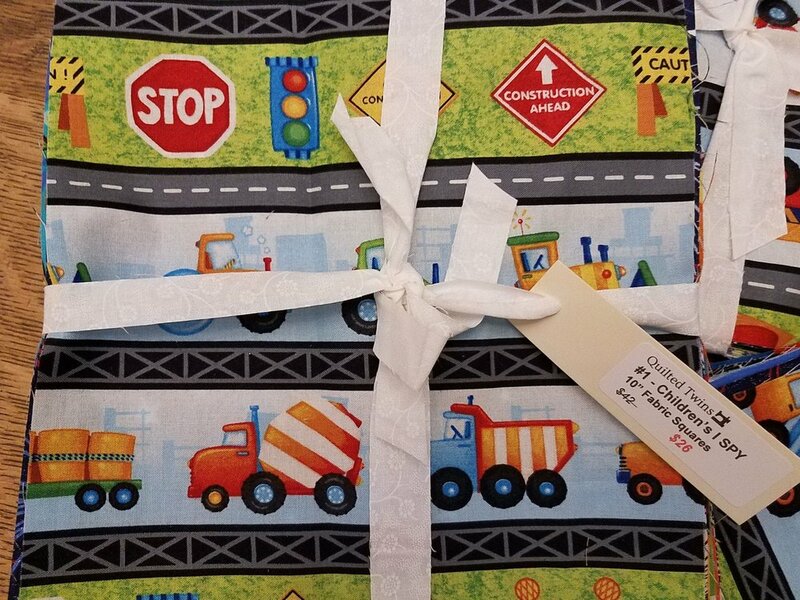 This smaller, lap size quilt is 51.5”x65.5” and is perfect for your child to snuggle up with while he watches tv or plays with his electronics or just sits next to you while you read to him! Don’t forget, you can make 2 of them with this package of squares (you will need to add a sashing/border fabric)! How cool is that? I’ve noticed while working here that many people seem to agonize over fabric choices. This little package of squares will help you by giving you a limited number of choices! This larger quilt, I’m calling a twin size, is 61.5”x86.5” and uses 35 of your 10” squares. The decisions are made for you - though you get to choose your favorite 35 out of the 42 that are i included! 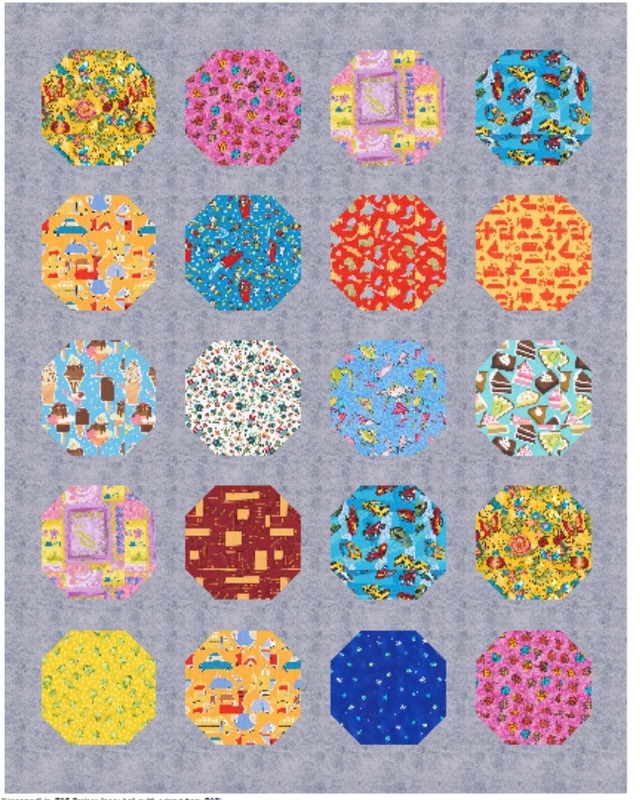 For each of these twin size quilts you plan on making, you will need 3.5 yards of a solid or blender such as the gray shown. And now you know…this is one of the things I’ve been up to lately! Don’t forget to order it here! It’s been great to meet several of my readers of this blog. Most of the people who have come into the store, however, do not seem to be aware of our blog or maybe even the website! More and more are learning of us, however. I’ve really enjoyed talking to those of you who have introduced yourself as readers of the blog! Thanks! Colors may be portrayed slightly different on the screen than in the actual fabric. Different screens portray things differently. Beautiful fabric with a look of storm clouds. When you see this fabric, you will think of storm clouds hovering on a bed of a lighter color. A beautiful blender fabric. Tone on tone.